So-young (Youn Yuh-jung) earns a living by being the ‘bacchus lady’; an older woman working as a prostitute, waiting by the public parks and offering ‘bacchus’, an energy drink, with sexual services to elderly men. She finds out that she has gonorrhoea from her gynaecologist. She takes in the young Minho after his Filipino mother is detained by the police because of stabbing his father at the gynaecology clinic. He lives with So-young in the Itaewon neighbourhood, which has a vibrant community. Meanwhile, most of So-young’s aged former clients and friends are struggling and frustrated to live at an old age with sickness and loneliness. In E J-yong’s films, he often places leading actresses as the main character, whatever directions or genre they might take. In The Bacchus Lady, he really challenges himself in conveying social issues about seniors. Although such issues have been addressed in mainstream news and documentaries, here E J-yong portrays them in emotional context. He takes So-young as the representation in social attitudes towards, seniors, including the ‘bacchus’ ladies working hard to earn a living, within South Korean society. The scenes, from maintaining her dignity as a ‘bacchus’ lady to ending her friends’ lives so that they don’t continue to suffer alive and alone, presents heartfelt perspectives in a seemly manner on how they behave. E J-yong also adds in the emotional pain through So-young’s sad and shocking murders on her aged former clients and friends. It is too painful to watch them crying out in pain and loneliness followed by making So-young be the murderer that make my heart sinks deeply. The offensive phrase ‘half-breed’ is heard throughout when referring to children of Korean mothers and African-American soldiers, as well as “Kopinos”, children from Korean men and Filipino. Similarly, E J-yong further exposes So-young’s painful past on abandoning her own child and healing time in taking care of Minho. The direction on portraying women is similar to Dasepo Naughty Girls and The Actresses. Not only he points out the social attitudes toward mixed-race children, he looks into the mothers’ responsibilities of taking care or abandoning their children without the husbands appearing in their lives. Yet, he takes on the challenging task in portraying “bacchus” ladies and mothers which are emotionally sensitive topics to address in his film. Youn Yuh-jung brilliantly showcases her contemplative and understanding of emotion in a role so different from her performance as an exaggerated version of herself (Behind the Camera and The Actresses) or as an arrogant lady in the house (A Good Lawyer’s Wife and The Taste of Money). While being outspoken and responsible, she focuses on the So-young’s kindness, doubts and weaknesses. So-young is one of the strongest characters that she portrayed throughout her career. It is a great opportunity for her to portray a different but challenging role as a struggling ‘bacchus’ lady with a motherly aura and razor-sharp tongue. The supporting cast play a huge role in supporting So-young’s story and character development. Yoon Kye-sang, acts as So-young’s one-legged neighbour, has kind and funny personality that lightens up the scenes such as casual neighbourhood conversations and his approach with the children. The three veteran actors splendidly portray their own characters as old aged seniors struggling with pain and loneliness followed by the direction on how they asked So-young to end their lives. 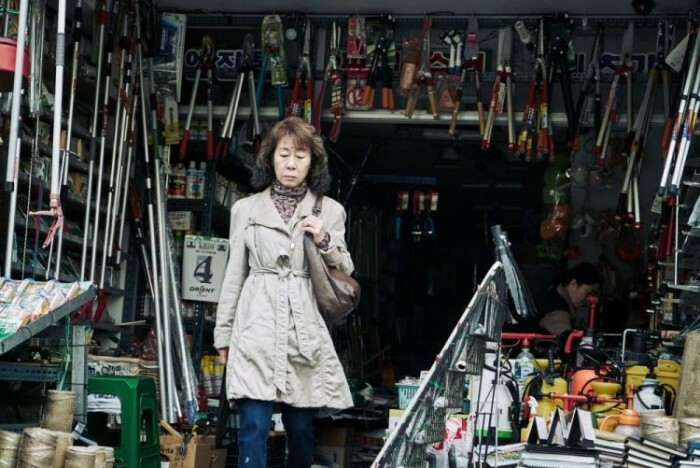 E J-yong continues to showcase portrayals of women but also highlighting the social attitudes toward seniors, mixed-race children and ‘Kopinos’ in South Korea. He is willing to challenge himself and have thoughts on how he can tell emphatic story based on these social news instead of facts that some audiences might not care about. He definitely deserves a huge applause for his courage and passionate effort to convey these issues in an emotional perspective that touches the audiences’ and critics’ heart. The Bacchus Lady has its first international screening in the Panorama section at the 66th Berlin International Film Festival. It is currently screened at the 15th New York Asian Film Festival.